Purple Laver - "Porphyra Umbilicalis". Purple Laver , an Edible Seaweed , is drapped over a rock , covered with sand on Bullslaughter Beach . 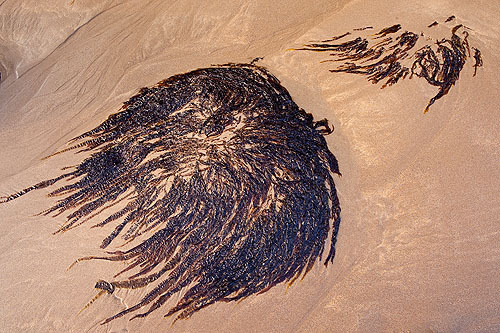 This purple red, gelatinous , membranous seaweed attaches to rocks via minute discoid hold-fasts, is greenish when young becoming purplish-red and has a polythene-like texture , it becomes black when dry. The seaweed is boiled for 5-6 hours , or more , until it is quite soft then minced to a thick black / green paste , known as Laverbread ( Welsh - Bara Lawr ) , it provides high quantities of potassium, iodine, iron, magnesium and calcium. Laverbread is traditionally eaten in Wales with fried Cockles , Bacon , Eggs , and Mushrooms as a solid meal , or can be rolled in oatmeal and fried. A quick way is to wash the laver in freshwater, remove all the sand , and then dry fry until crisp.